This is a great use for some of those colored Easter Eggs you will have next week. Perfect weight loss surgery friendly appetizer, snack or lunch. A large egg provides 6 grams of protein. Whiz eggs in a mini food processor till desired consistency. Add eggs to remaining ingredients and mix together. Pipe (or spoon) onto low carb choices like cucumber slices or fill cherry tomatoes or celery. I can never be bothered to get fancy and just end up using a teaspoon. I do use this groovy gadget to make cool cucumber slices. Makes enough for 50 cucumber slices. 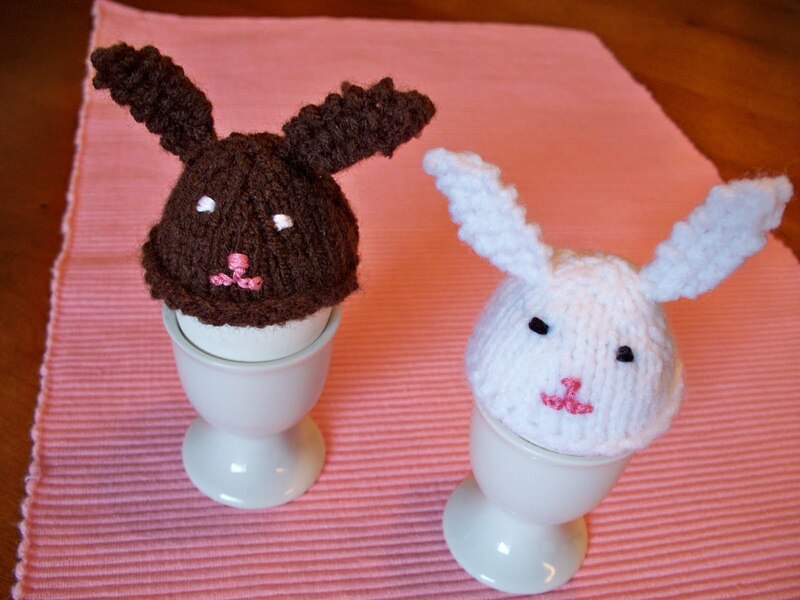 Got an early Easter gift from my Mum... she made me Chocolate & Vanilla Easter Bunny knitted egg cozies. I have 2 in each color. Aren't they the cutest things?! Michelle - I think I love you! Bacon and egg! You are a culinary genius. Thanks! I'm making these this weekend! You are way out there in the lead in the makeover sweepstakes! Woohoo!! Shelly please tell your Mom I think yjay yje bunny's ar absolutly beautiful what a wonderful gift..And I hope you and she noth have a wonderful Easter!!! Oh I think I may be in love with you even more! This sounds delish (and easy enough for a non-cooking type gal like me to master). And those bunny's your mum made are just TOO cute! Tell her she should market them! Talent runs in your family. Happy Easter to you, your Mum and all your family! Oh my stinking goodness. Those bunnies are ADORABLE! And I was just thinking what else I could make for our Easter brunch. I think cucumber bites will be a hit! This is just the perfect thing to take to a party for something healthy and filling to nibble to stay away from those wicked high fat potato chips etc. that you can inhale in seconds! So cute! Cozies rock! And bunny cozies in the same post as the egg salad WAY rocks! Grill saga continues....so I read the manual (online since I have misplaced mine) and it suggested cleaning all of the little holes in the burner tube assuming the tube is not blocked....there are a TON of tiny holes! So I did that and got a slight improvement. I think I need to order a new burner.....maybe. :-( Still love the grill though! What I love about your blog is that you do the obvious - but I never think of it. Greek yogurt, of course! I am waiting for the Eggface Cookbook! Or Eggface Food Delivery for GB patients. Thanks for all your great tips and ideas. Shelly, love your recipes and your blog! Your mum is so sweet and talented...egg cozies. Too cute! OMG...I just made the egg salad but with a with adjustments. I didn't have Fage yogurt, so I used fat free sour cream instead. Also, used regular mustard instead of Dijon. It was soooo delicious! Thank you for all that you do! You totally rock!!! Yummo!! I made these for a party tonight. They were a hit. Sooo good! Yummo!...previous poster took the words right out of my mouth. Made this morning for a light lunch later. Love all your recipes!